User can export MS SQL data into new database or overwrite the contents of an existing MySQL database. Software efficiently converts larger MS SQL database or selected table's records. Download demo version database convert application from our website and install on your computer and convert your five database records. Database converter tool supports unique and primary key constraints. Work with all major versions of MSSQL (2000, 2005). ...... Work with all major versions of MSSQL (2000, 2005).
? 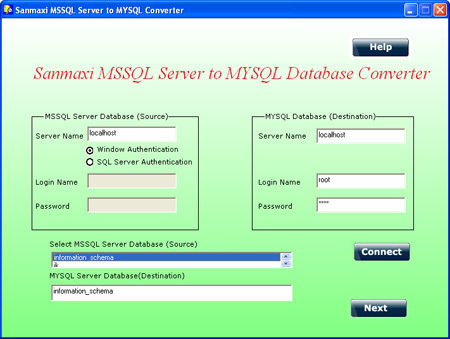 Advanced database conversion tool or MSSQL to MySQL database converter convert entire or selected database table records.
? MSSQL server records DB migration utility migrates MS SQL server to MySQL file format. Qweas is providing links to Database Converter MSSQL to MySQL 5.0.1 as a courtesy, and makes no representations regarding Database Converter MSSQL to MySQL or any other applications or any information related thereto. Any questions, complaints or claims regarding this application Database Converter MSSQL to MySQL 5.0.1 must be directed to the appropriate software vendor. You may click the publisher link of Database Converter MSSQL to MySQL on the top of this page to get more details about the vendor.